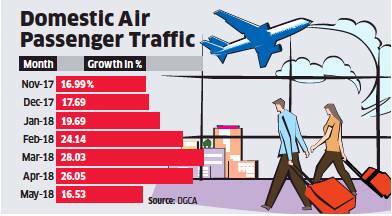 The number of domestic air passengers in India registered a slower growth of 16.53% during May on account of rising fuel prices leading to increase in fares. Indian carriers carried 11.9 million passengers during the month, up from 10.17 million in May 2017. Industry insiders say that lower growth is due to higher fares but expect the growth trend to continue. However, all key scheduled carriers flew their planes with over 80% of their seats full. Gurgaon-based SpiceJet continued to maintain its pole position in terms of load factor by flying its planes 94.8% full, followed by IndiGo, which flew its planes with 91% seats followed by AirAsia India at 89.7%. In terms of operating flights on time, Air India became the worst performer for May. While Air India operated 69.8% of its flights on time, IndiGo topped the list by operating 80.9% of its flights on time. SpiceJet was second, having operated 80% of its flights on time. IndiGo remained the market leader in terms of passenger carriage, by flying 40.9% of the total passengers during May. Jet Airways was second by flying 15.2% of the passengers, while Air India was the third-largest carrier in terms of market share, accounting for 12.8% of the passengers flown during the month.